Edna writes that the Teacher's Association at the New Thought Temple had voted to send $150 for a scholarship, but that it will be sent in two installments. She encloses $75 with this letter and asks for updates about Berry so that she can inform the children at the Temple how their contributions are being used. 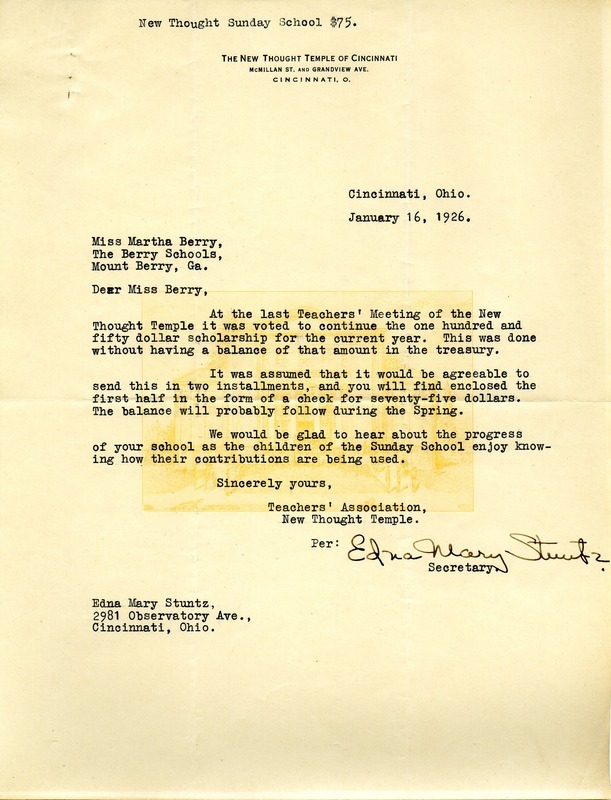 Edna Mary Shuntz, “Letter to Martha Berry from Edna Mary Stuntz.” Martha Berry Digital Archive. Eds. Schlitz, Stephanie A., Chelsea Risley, Alan Henderson, et al. Mount Berry: Berry College, 2012. accessed April 25, 2019, https://mbda.berry.edu/items/show/3404.